Before you graduate, take a tour of the Octagon House, a reportedly haunted house with beautiful architecture and famous former residents, such as U.S. President James Madison. After visiting the Smithsonian, the Lincoln Memorial and the Georgetown Waterfront more times than you can count, you probably think you’ve seen all D.C. has to offer. Before your final year at GW is up, there’s still some time to check out the lesser-known D.C. history, art and entertainment venues that you might have missed when you were too busy cramming for exams or interning on Capitol Hill. From gardens to a concert hall, these are the four must-sees before you graduate on the Mall. There’s plenty of art to be found outside of the National Gallery. The luxurious Hillwood mansion — formerly owned by the heiress to the Post Cereal company fortune, Marjorie Post — displays collections of 18th century French and Soviet-era Russian art and furniture. If you prefer to enjoy the warm weather, ditch the National Mall and take a stroll through one of Hillwood’s gardens instead. The serene Japanese garden boasts stone lanterns, sculptures and a pond filled with lily pads while the vibrant rose garden is home to 15 types of roses. There is no official entry fee for the Hillwood estate, but a $15 donation is suggested. While riding the Vern Express, you probably spotted the steps in Georgetown where part of the horror movie The Exorcist was filmed. 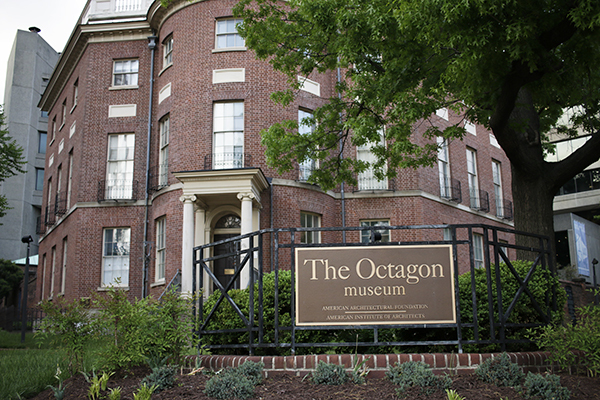 But Foggy Bottom is home to an even more haunted site: the Octagon House. With its circular front, brick exterior and pillars at the entryway, the three-story structure seems a bit out of place next to modern DC buildings. Built in 1799, the Octagon House isn’t just famous for its irregular shape, spiral staircases and well-known former inhabitants, like the family of former President James Madison. Visitors have claimed to hear and see ghosts in the home’s bedrooms and garden. You can inspect the house’s spirits yourself. Admission is free and reserving a guided tour is $5 for students and $10 for adults. Plenty of students have visited the Newseum or the International Spy Museum, but before graduating, make sure to check the Crime Museum off of your bucket list because the best museums are the ones that bring out your inner-child. While learning about an extensive history of criminal law and justice, you can also participate in interactive games like simulated shooting galleries, computer-hacking challenges and lie detector tests. The Crime Museum also displays authentic artifacts like medieval torture equipment and the car in which outlaws Bonnie Parker and Clyde Barrow, famed for their bank robberies in the 1930s, were killed. General admission tickets for adults cost $18 online and about $22 at the door, about the same price as $23 admission at the Newseum and $22 admission at the Spy Museum. If you’re hoping to catch one last show in D.C., check out the Howard Theatre for a change of scene from Lisner Auditorium and the 9:30 Club. Don’t let the intimate venue’s sleek, modern architecture and neon blue lights fool you – this historical concert hall has hosted artists like Duke Ellington and Ella Fitzgerald since opening in 1910. It was renovated in 2010 and now hosts various musical and comedy acts. Some of the theater’s more recent performers include comedian Wanda Sykes, R&B group Boyz II Men and rappers Hoodie Allen and Kendrick Lamar. Upcoming shows include a 90s cover band called White Ford Bronco and rapper Tech N9ne.